Open all year round, Bruckless House Gate Lodge of is available to rent for self-catering holidays. Situated on 18 acres of parkland, the Gate Lodge is surrounded by its own garden just off the private driveway leading to Bruckless House. Guests can stroll down the avenue to reach the rocky shoreline of Bruckless Bay. 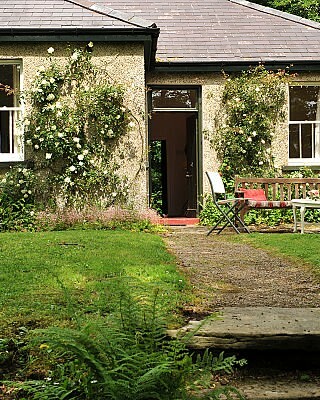 They are always welcome to call at Bruckless House with its informal gardens and cobbled yard, where poultry wander between the Connemara Ponies. Free wireless Internet connection is available at Bruckless House. The Gate Lodge is comprised of four rooms in total. There is a livingroom-kitchen with an open fireplace, a full-sized bathroom and two bedrooms. There is a television set provided and all rooms have electric storage heating. Bruckless House was built in mid-18th century by a Plantation family, Nesbitt, but quickly passed into the hands of an Irish family, the Cassidys. It remained with them right into the 20th century. Legend has it that a Gate Lodge was built along with the House and that it was located at the then main entrance, near the River Stank off the present-day main road. Today there are no signs of this building - it was probably demolished to make way for the tracks of the County Donegal Railway. By 1894 the main entrance had been removed to the present location, using a bridge to cross the railway, but no gatelodge was built until the new century. In 1903 the House passed into the hands of Thomas Kelly Grene who was a very enthusiastic gardener, opening his grounds to the public twice every year to exhibit his shrubs and flowers. He was a wealthy man with influence in the County Donegal Railway. He used this influence to have stone transported by the railway to the site of today’s Lodge. He built it, it is said, to house his gardener. It was constructed in the hipped style of the House itself and plastered in a similar fashion. It is L-shaped with four rooms and a central passage, all at the one level. At the north side, the remains of some sort of byre, with a cobbled floor, was used as an outhouse for fuel. There is direct access to the residence from a side gate at the end of the railway bridge as well as from the main gate. Calendar / Open Open all year.